Create a pesto calzone that's more fun than ordering in, and just as delicious! 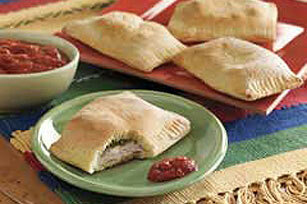 For variety, try different fillings for your Turkey-Pesto Calzone. Preheat oven to 400°F. Unroll pizza dough onto clean work surface. Pat out to 15x11-inch rectangle; cut in half lengthwise, then in half crosswise to form four rectangles. Cover each dough rectangle with 4 turkey slices, 1 cheese slice and 1 Tbsp. pesto; fold rectangle in half to enclose filling. Seal edges with fork. Place on baking sheet sprayed with cooking spray. Serve with fresh crisp CLAUSSEN Pickles, cut-up fresh vegetables or a colorful fruit salad. Makes 4 servings, one calzone each.